Tesla Motors has been one of the most exciting automotive companies to emerge in recent years. Tesla has single-handedly launched electric cars from fantasy to reality. Its flagship car has rocketed to the top of reviewer’s end of year lists and the company has become a model of modern American engineering. Following a decade that saw American auto manufacturers suffering financial crises, Tesla Motors has re-established that the American automotive industry is far from dead. That’s some high praise, we know, but let’s take a look at what sets Tesla apart from other car manufacturers and reveal just why they’ve earned the top spot on just about everyone’s list. The Tesla Model S comes in at anywhere from $70,000 to $120,000. Most of what you’re paying for is additional range. The base model, with an MSRP of $59,350, has a range of 230 miles, on average. The premium model, costing as much as $120,000, comes with additional charging equipment and a maximum range of 300 miles, on average. The Premium model costs $85,000 on average. Consumer Reports – Consumer reports gave the Tesla Model S their highest test score – 99 out of 100 points. They describe the Tesla Model S “like crossing into a promising zero-emissions future. New York Times – While the reviewer loved the design of the Tesla Model S, he expressed deep reservations about the battery life. Trying to drive the car in February from Washington DCto Boston, he found repeated issues with the battery charging and the estimates of charge remaining, culminating in his car getting towed to the nearest charger. Elon Musk, Chairman & CEO of Tesla, rebutted many of the reviewer’s claims in a subsequent blog post. The Tesla Model S, first showcased in 2009 and finally released in the United States in 2012, was built in what was once the NUMMI plant, in Fremont, California. NUMMI, a groundbreaking joint venture between General Motors and Toyota, was an initiative to import more efficient, higher-quality manufacturing methods into the United States, and is largely responsible for the slow but steady resurgence of American car manufacturing. Powered by a either a 60 or an 85 kW-h Lithium ion battery pack located underneath the car chassis, the 60 Kw-h model provides a 230 mile range while the 85 kW-h model offers a maximum 300 miles. Recharging can happen either via the standard onboard charger, which recharges at 5 miles per hour, or via Tesla’s own High Power Wall Connector, which restores 62 miles per hour of charging. Tesla has made available a number of Supercharging stations all over the country, capable of extremely fast recharging. Free to Tesla customers (though those with ‘standard’ 60Kw-H batteries will need to pay for an additional one-time upgrade costing $2500), these stations can recharge the entire battery in under an hour, providing up to 300 miles of driving range. There are 79 Supercharging stations at present, located near roadside cafes and shopping malls off of major highways. Last year, Tesla announced plans to build battery swapping into its supercharging stations, allowing users to drive off with a full charge in less than 90 seconds. Tesla plans to charge $60-$80 for this service, equivalent to the price of 15 gallons of gasoline. Previous electric cars were badly underpowered – capable only of low speeds and agonizingly slow climbs uphill. The Tesla Model S changed that. 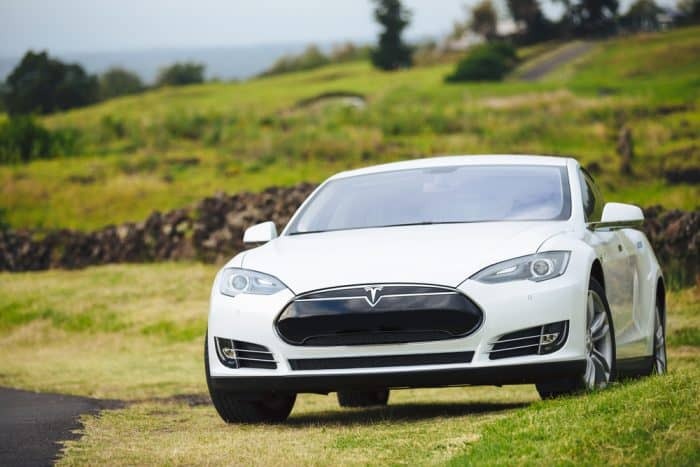 The Model S is capable of an astounding 325 pounds per foot of torque. By contrast, the 2013 Dodge Challenger is capable of only 268 lb-ft of torque, even with its vaunted HEMI V8 engine. The Model S comes with 302-416 Horsepower (depending on model) making it capable of going 0-60 in up to 4.2 seconds with a top speed at between 120-130 mph, depending on the model. The Model S is radically different from gas-guzzling cars – and takes full advantage of it. Without the constraints of an internal combustion engine, Tesla was able significantly lower the car’s center of gravity, resulting in much tighter cornering and more responsive control. On its face, an electric car would have much less environmental impact than a gas-guzzler. However, the story is a bit more complicated than you might think. The first factor to consider is the electric batteries. Made of Lithium Ion, they create a fairly significant amount of pollution to produce, and rely on an especially finite element, Lithium. However, this is a consideration with all car manufacturing, and while a Tesla’s production impact would probably be greater than other cars, the exact difference is open to debate. The more important factor in determining Tesla’s environmental impact is where you live, and how your electricity is generated. The Tesla Model S batteries use a significant amount of electricity, which increases energy consumption. The overall cleanliness of the Model S must take into consideration the type of power plant supplying electricity to owner’s homes. According to Will Oremus at Slate, if your electricity is produced from coal, your car’s environmental impact can be roughly equivalent to an efficient gas-guzzler. However, if you live somewhere running off of nuclear, natural gas, or renewable resources, then your car’s environmental impact will be relatively minor.